Seth Klarman is the founder and president of The Baupost Group, a Boston-based private investment partnership. He wrote a book named ‘Margin of Safety: Risk-Averse Value Investing Strategies for the Thoughtful Investor’ which is an investment classic, but has been out of print since 1991. If you google for this book, you will find a scanned copy here. For the individual investor, this is perhaps the best book you will ever read on investing, after The Intelligent Investor by Ben Graham. 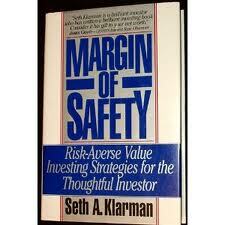 Margin of Safety provides an excellent framework for value investing for the ‘enterprising’ investor referred by Graham. The entire philosophy of emphasizing risk over returns, and avoidance of loss as the cornerstone of any investing decision is over-arching in this book. The book starts by providing reasons why most investors fail, how Wall Street (or Dalal Street or the financial industry) is not structured to work for the investor, as well as the Institutional constraints and performance race that they face which makes chasing market returns mandatory for them. Further, Klarman goes on to define the value investing philosophy based on the margin of safety as the foundation, the art of business valuation along with techniques for the same, as well as the process for finding value investments. Klarman describes three elements of a value investment philosophy: a bottoms-up approach to selecting investments one stock at a time, absolute performance orientation that enables one to buy and hold irrespective of short-term relative non-performance, and paying attention to real risk of capital loss not beta (volatility). Klarman discusses the difficulty of the art of business valuation and recommends arriving at conservative but imprecise range of business value based on 3 or 4 techniques: Net Present Value of Free Cash Flows, Liquidation or Breakup value, and Stock Market Value – providing practical examples for various scenarios. The last section of the book is more technical providing details of the three major areas of opportunity for value investment, namely catalysts, market inefficiencies and institutional constraints, as well as then going on to provide detailed evaluation methods for thrifts and bankruptcy situations. Eventually, Klarman goes on to provide insights into portfolio management as well as selection of a money manager for value investing.